Imagine taking those first few steps into a clear pool at the perfect temperature and then starting to swim through the sparkling water…bliss! If you’d like to experience this then Bluecoat Sports swimming pool is waiting for you. Whether you’re a power up and down the pool type or a gentle swim back and forth type, our inviting swimming pool is ideal for all types of swimming. With six lanes there is plenty of room for everyone and the pool is exclusively for the use of members and their guests. The pool is shallow at both ends and only 1.8m deep in the middle, perfect if you’re just getting started in the pool or with the children. At 25 metres long it is also great for swimming lengths and building up your stamina. Swimming is considered to be a very safe form of exercise as the buoyancy of the water means it is low impact and gentle on your joints. It helps strengthen your heart and lungs, reduces stress and can even help your confidence; we think these are fantastic reasons to take that dip! Of course, your safety is of paramount importance to us. You can enjoy your swim safe in the knowledge there is a lifeguard always on duty. Our friendly lifeguards are always happy to help with any questions you may have and are there for the well being of all our swimmers. Intensive holiday swim courses including beginners, stroke clinics, flip’n fun, aqua extreme and snorkelling! If you’re thinking the kids have all the fun, there’s plenty at Bluecoat Sports swimming pool for the adults too! With beginners and improvers classes, we can help build your confidence in the water or help you improve your current techniques. If you’re taking part in a triathlon or open water event, come along to our front crawl clinic to help you power on through. And for the advanced swimmers amongst you, we have classes to build your endurance and take you to the next level. Here at Bluecoat Sports, we understand some of you prefer quieter times to swim. If you’d like a more relaxing environment to swim in and are over 60, come and enjoy a Swimming in Retirement session. You’ll have a dedicated pool to yourselves to enjoy at your leisure. Once you’ve taken advantage of our fantastic Bluecoat Sports pool, you can use our 15 person sauna to help you really relax. This is open for members whenever the swimming pool is. 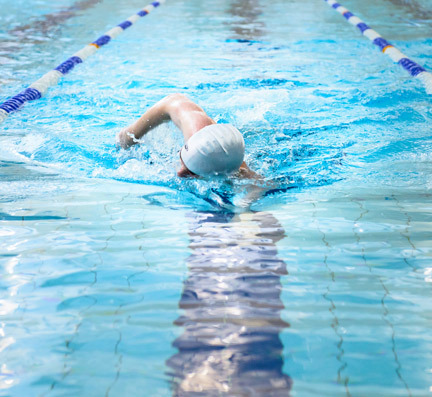 We always aim to have pool sessions for members in the morning, lunchtime and evenings, however exact times vary from term to term due to Christ’s Hospital School. In the holidays, there’s a special holiday timetable in place with even more opportunities for you to enjoy the pool. Get up-to-date information about our pool opening times on our timetable. It’s easy to book a session in advance with our online booking system. or if you would like to chat to one of the team about our swimming opportunities, please complete the form below and we will be in contact as soon as possible.